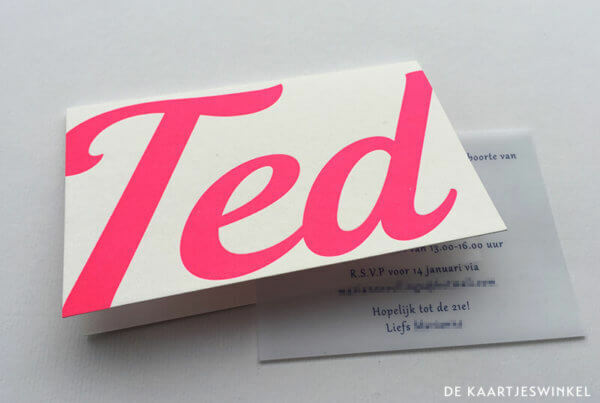 Welcome to our letterpress and design studio! 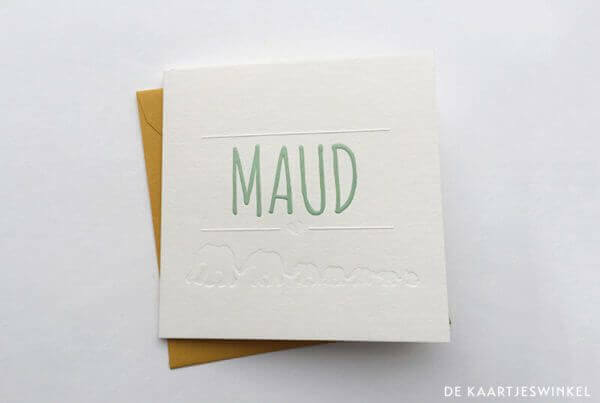 It’s great that you’ve found our webiste full of birth cards, wedding invites, greetingcards and more. 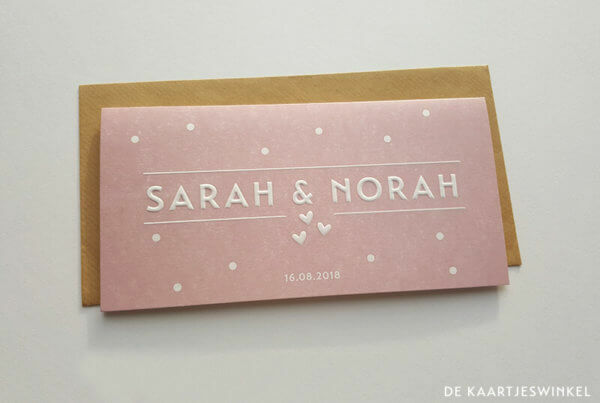 You have probably seen our designs and products on Instagram or Pinterest. 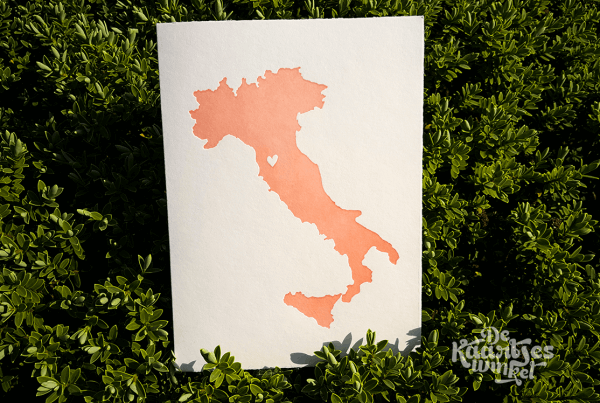 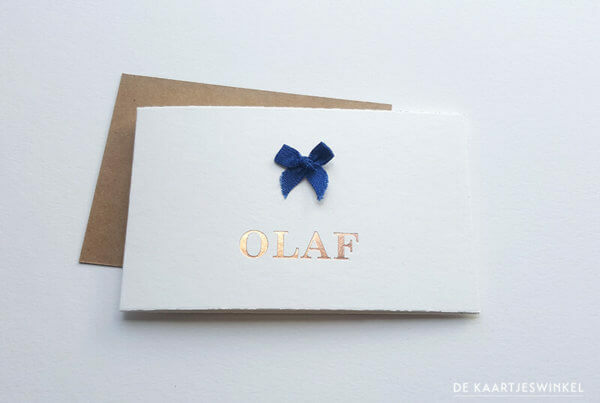 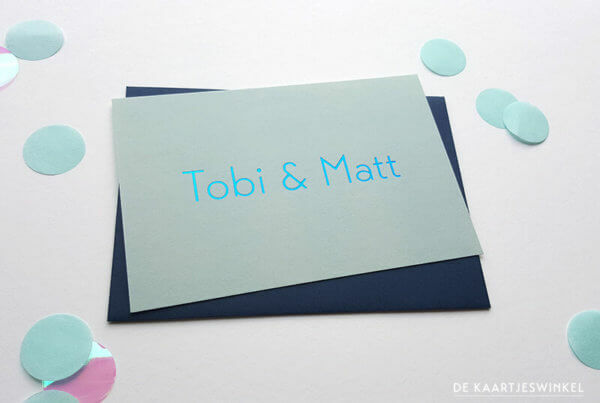 Even for you while living abroad, we can design and print your letterpress, foil, duplex or print cards. 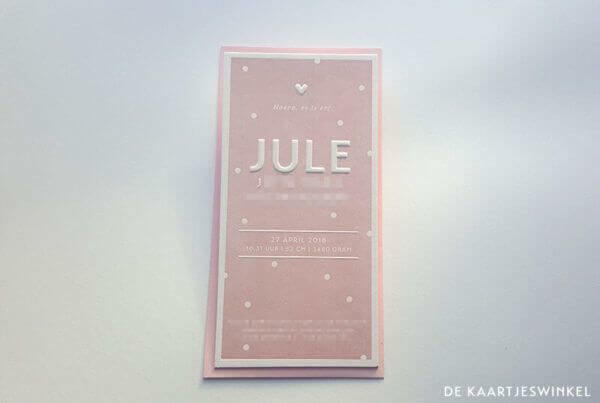 We have send birth announcements to our customers in Thailand, Singapore, Kuala Lumpur, United States, United Kingdom, Germany, Belgium, France. 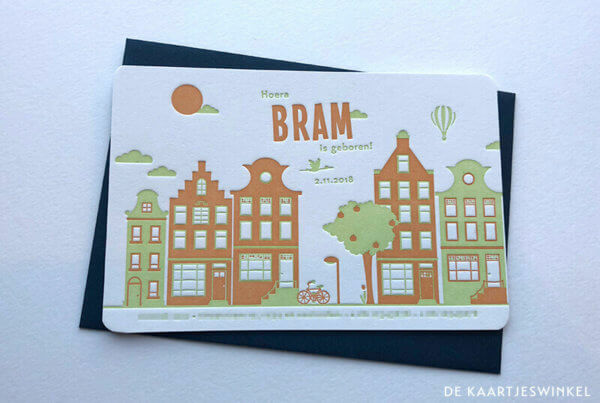 It is no problem to send your cards all over the world. 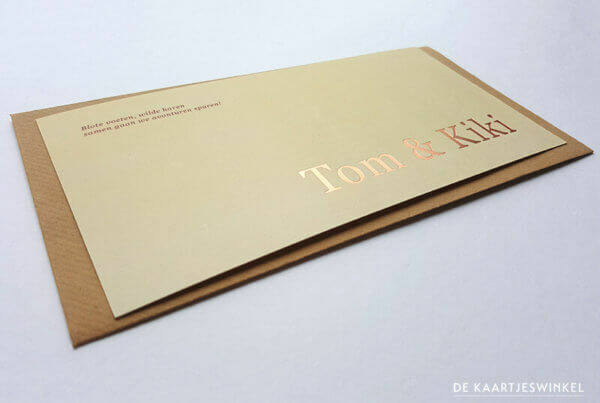 There are a couple of important steps to take before we have a beautiful design in hands. 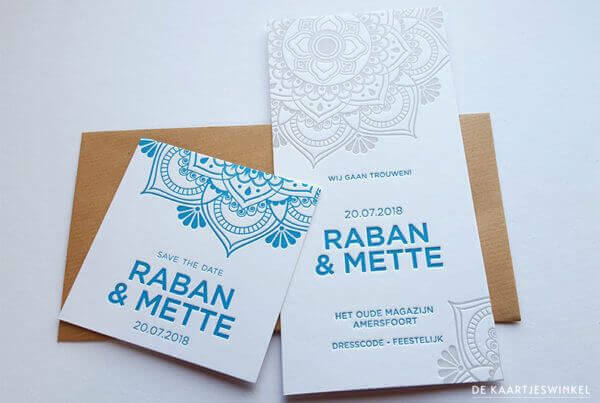 You can choose for a design from our online collection or you can choose for a custom design made according to your wishes. 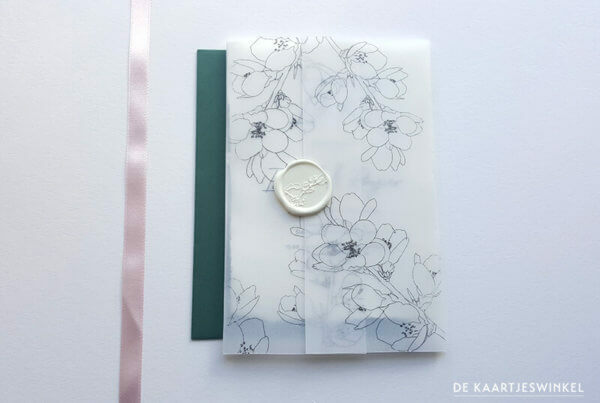 Please have a look at our ‘Working method’. 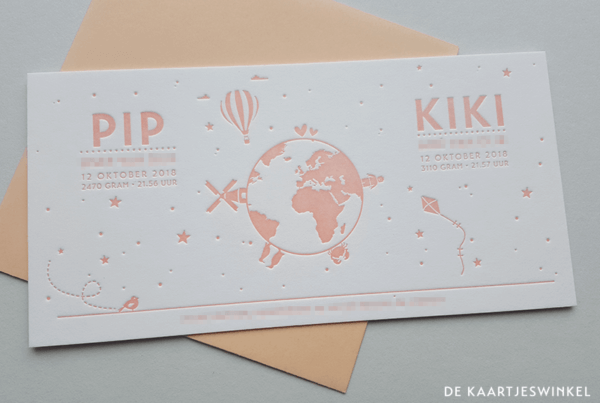 A normal production time after final approval of your ticket is between 1 – 3 working days. 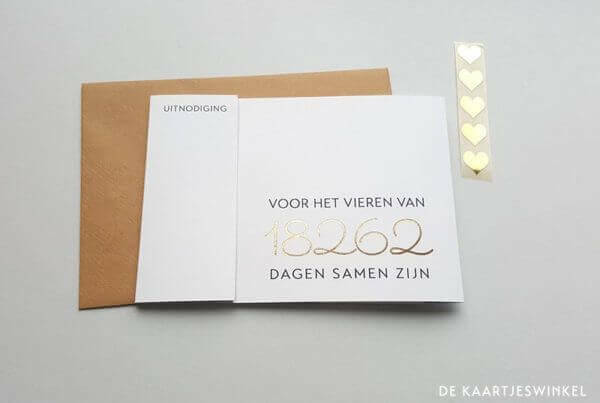 This means that your order will be shipped no later than the third working day (in the Netherlands). 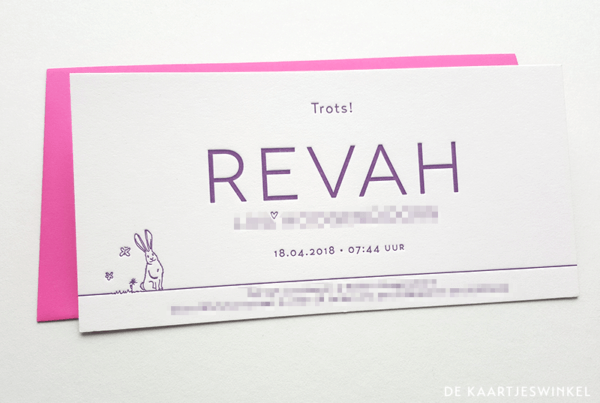 A normal production time after final approval of your ticket is between 5 – 6 working days. 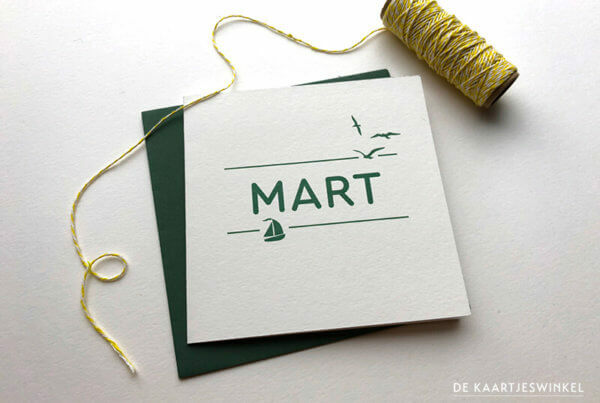 This means that your order will be shipped no later than the third working day (in the Netherlands). 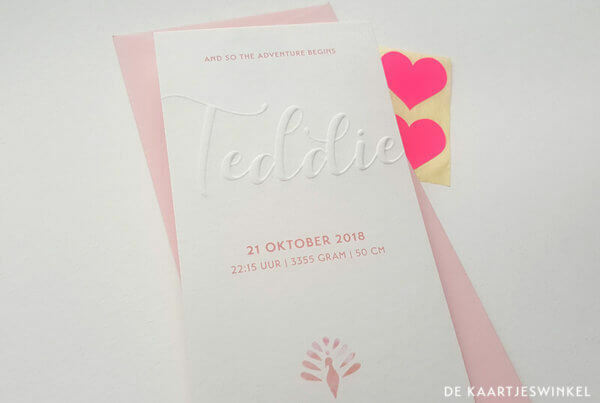 After receipt of payment and agreement on the final design of your birth announcements, the production time is between 5 – 6 working days. 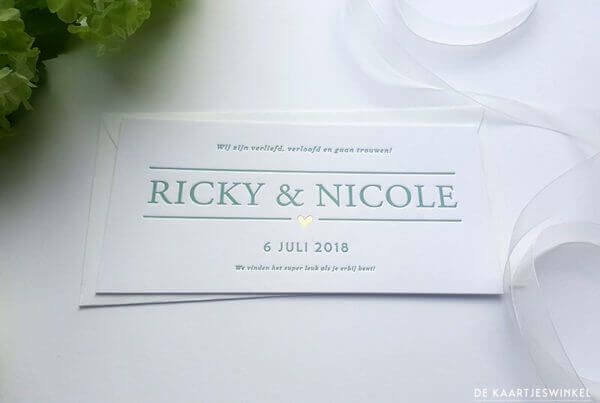 This depends on the number of printing runs of your card. 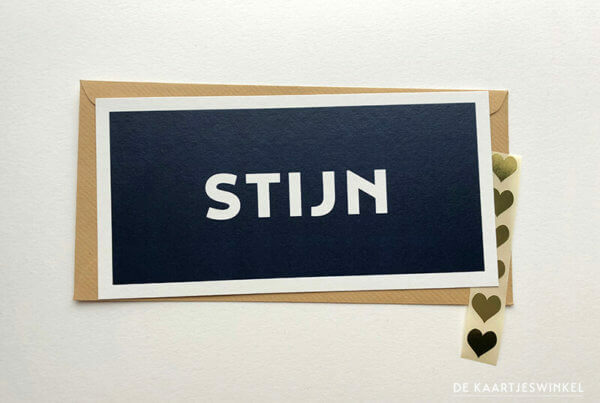 After this we offer the order to PostNL. 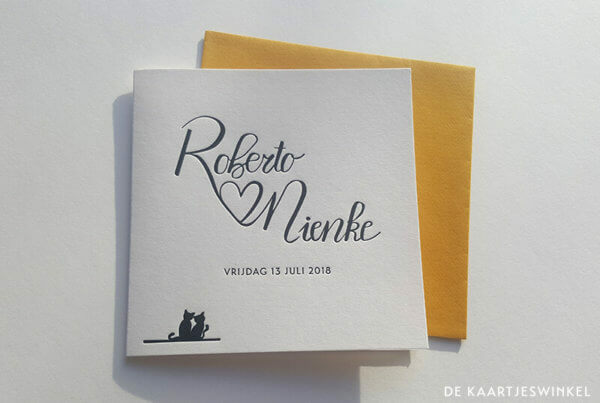 This means that there is almost always a weekend in between, and you will receive the order after about a week (in the Netherlands). 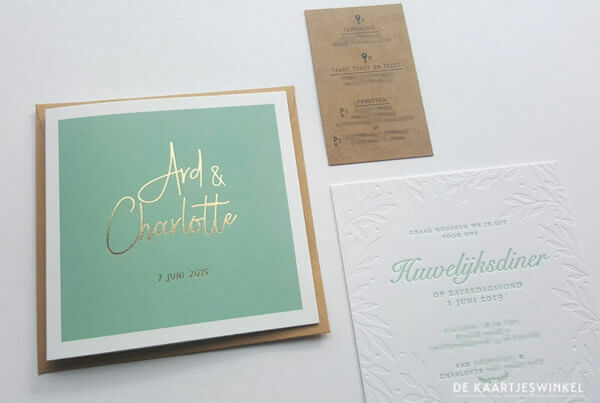 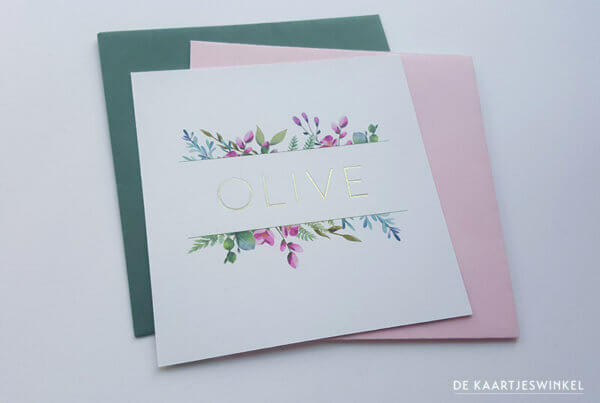 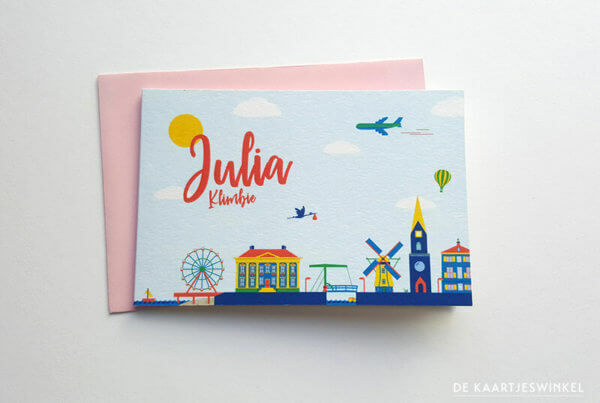 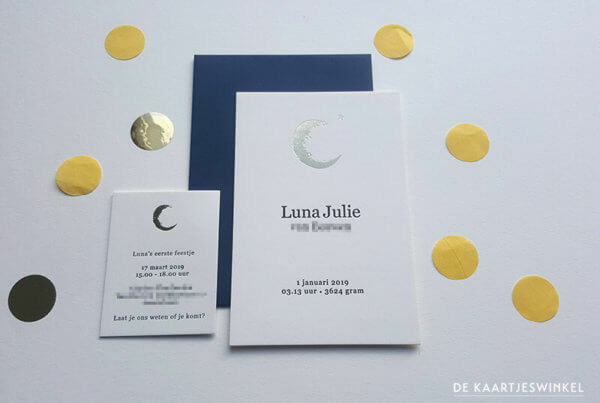 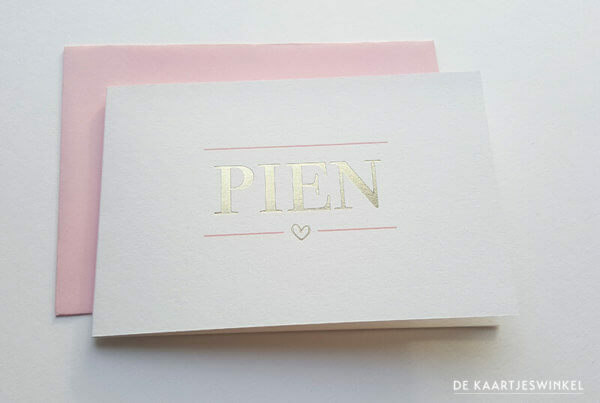 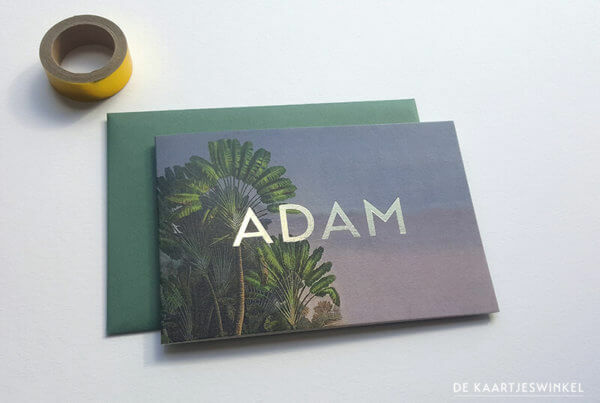 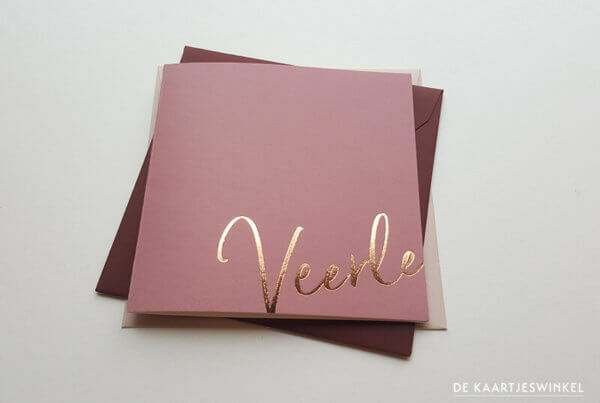 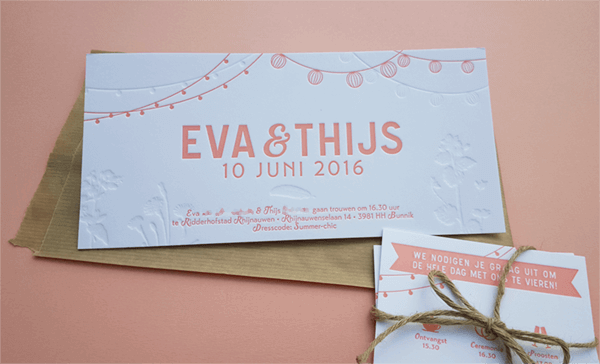 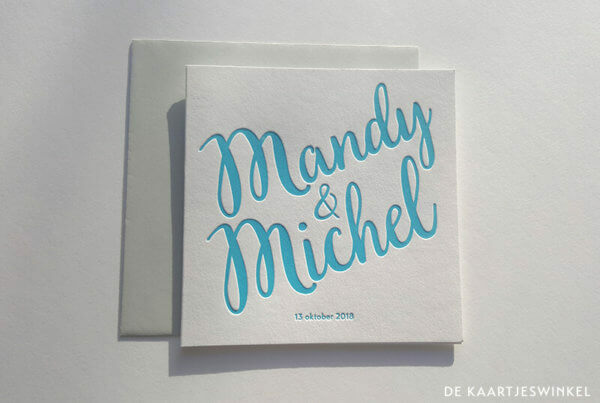 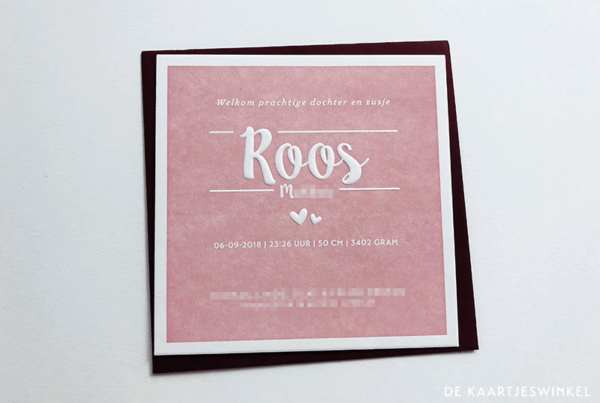 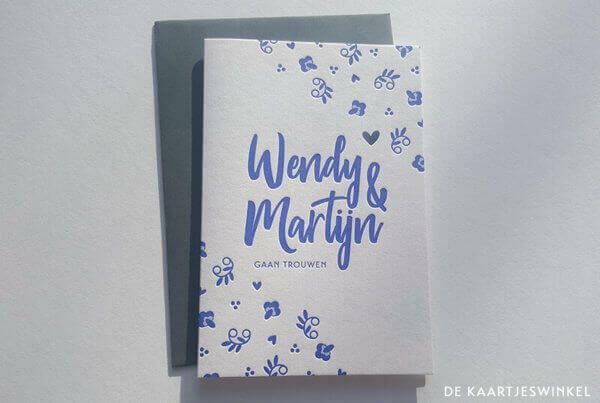 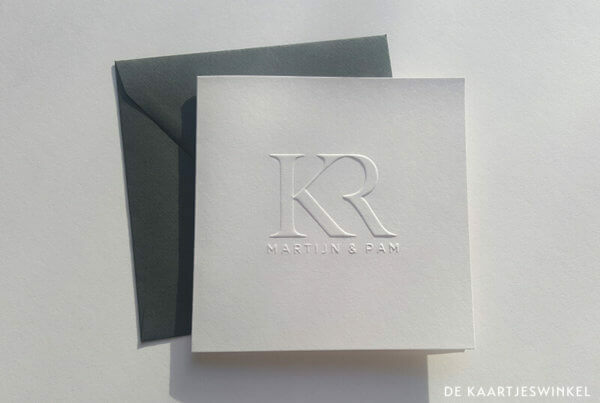 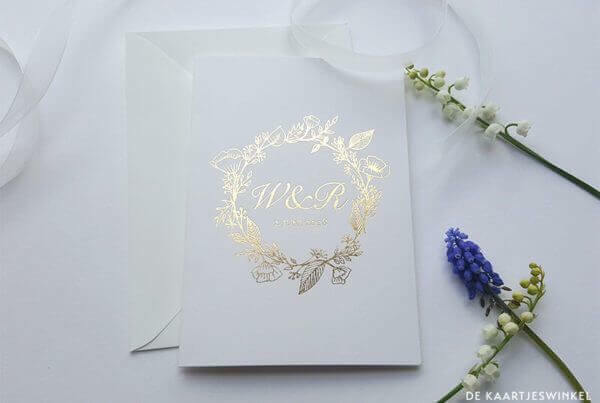 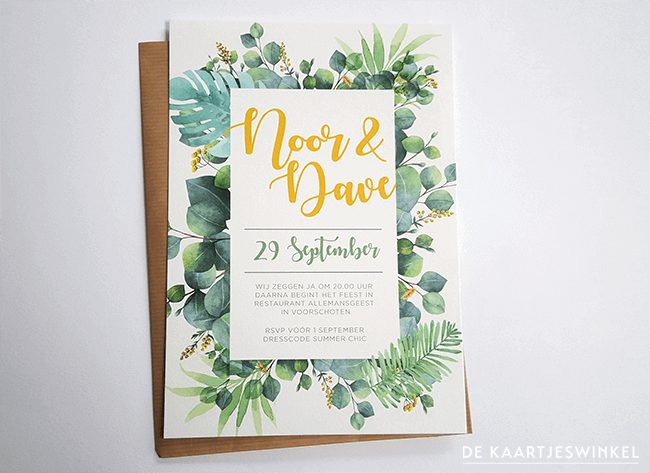 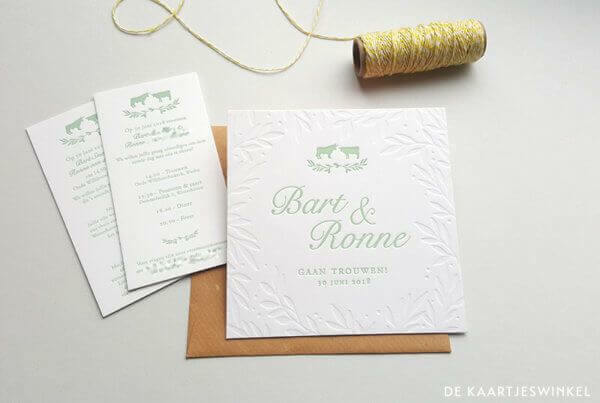 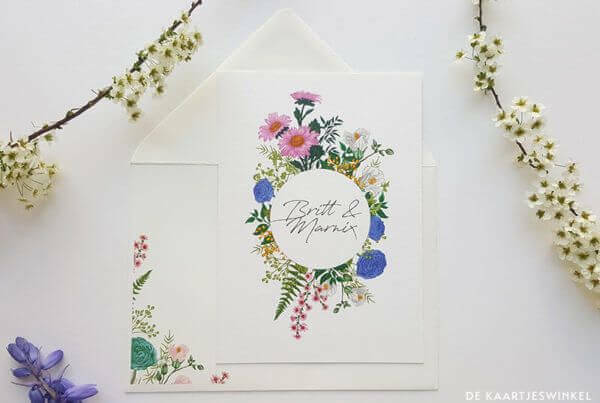 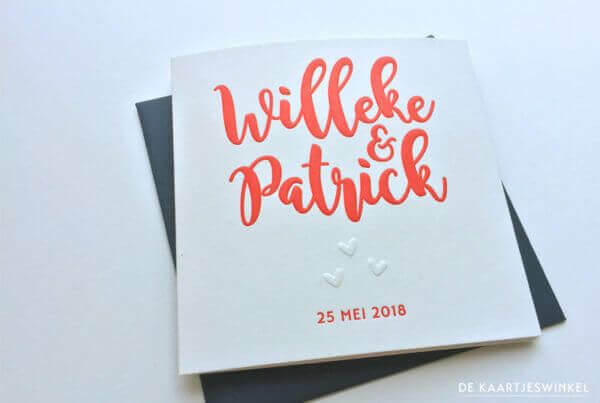 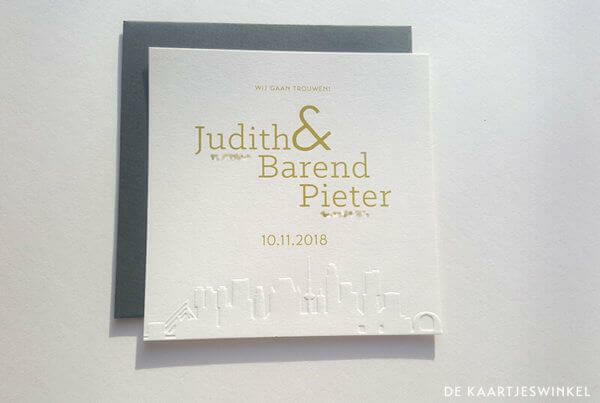 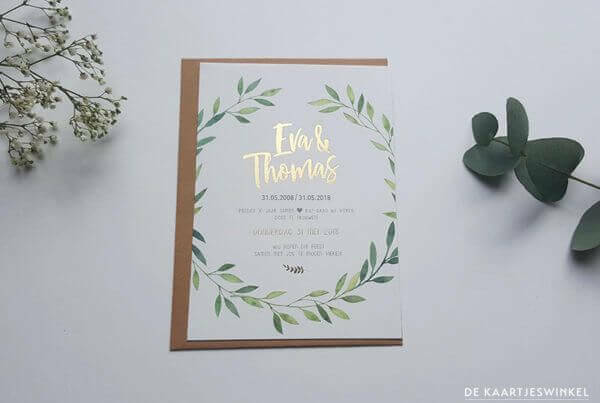 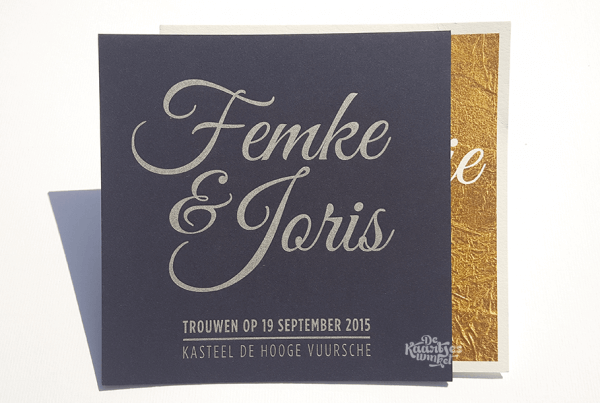 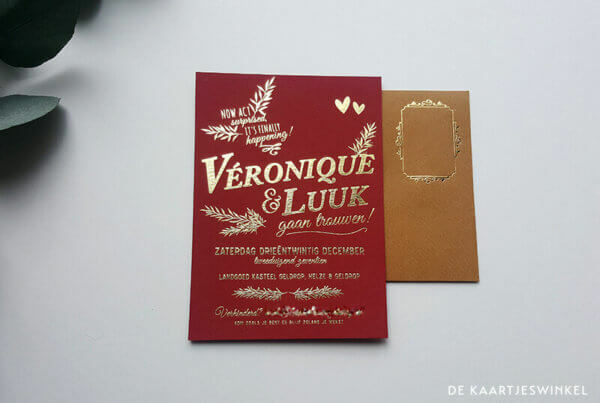 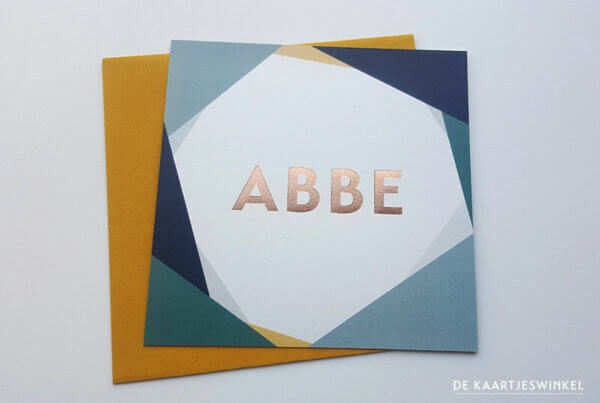 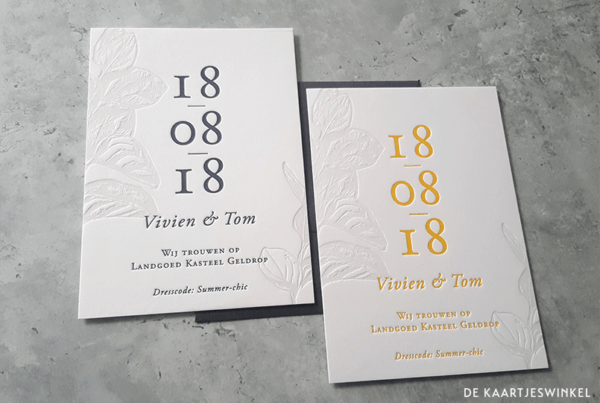 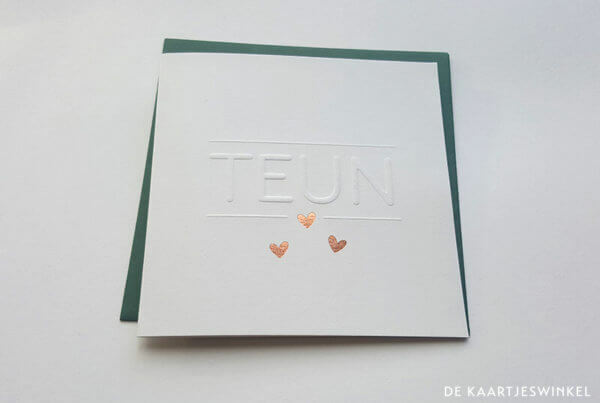 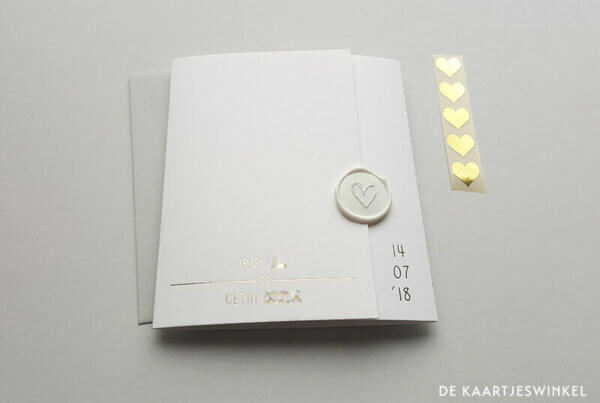 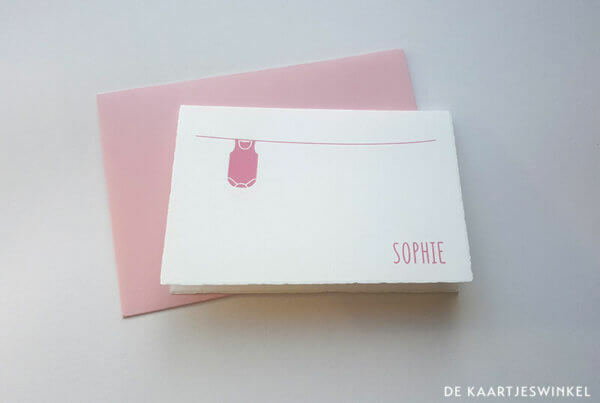 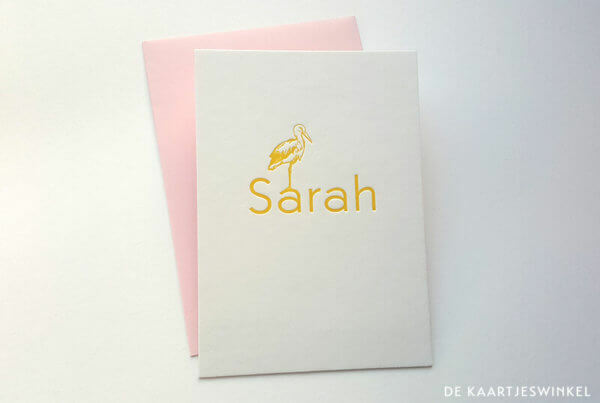 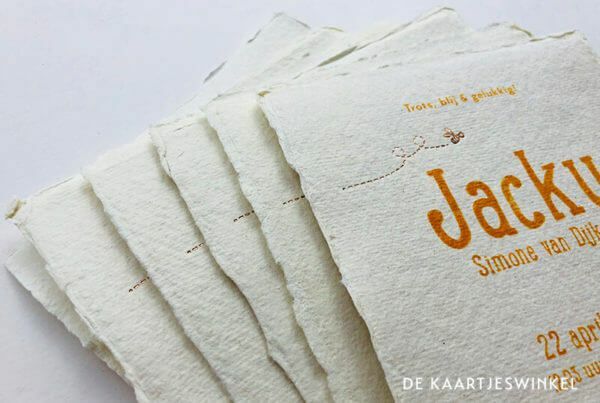 After receipt of payment and agreement on the final design of your wedding cards, the production time is between 8 – 12 working days (in the Netherlands). 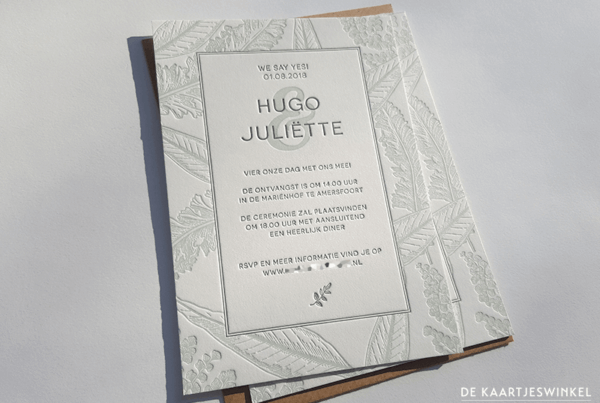 After this we offer the order to PostNL .